In general, having a persistence-ignorant application provides a lot of flexibility. Allowing us to easily port between various RDBMS’s, NoSQL data stores, text files, the cloud, or simply storing our data on papyrus managed and maintain by a group of beer-making monks provides us with tangible opportunities to cross-sell our (non-hosted) application to multiple clients. Some organizations may want the application to work on a database with binary collation. Rare, but it could happen. Organizations might be using another database, and not all databases are case insensitive, even by default. The most curious finding is MySQL. 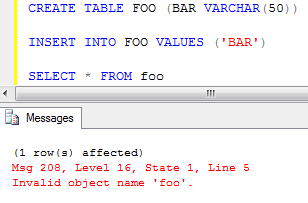 I’d love to know what reasoning was used to come to the conclusion that Table and Column names should be case sensitive, but data should be considered insensitive. In any case, programming for the least common denominator requires handling these situations. Ideally you’d leave the SQL to an ORM. If your application is unlikely to switch database platforms and an ORM is out of the question, I’d recommend a RDBMS-specific data access layer. If you’re application absolutely must have a generic data layer, though, you must keep this in mind as part of design.